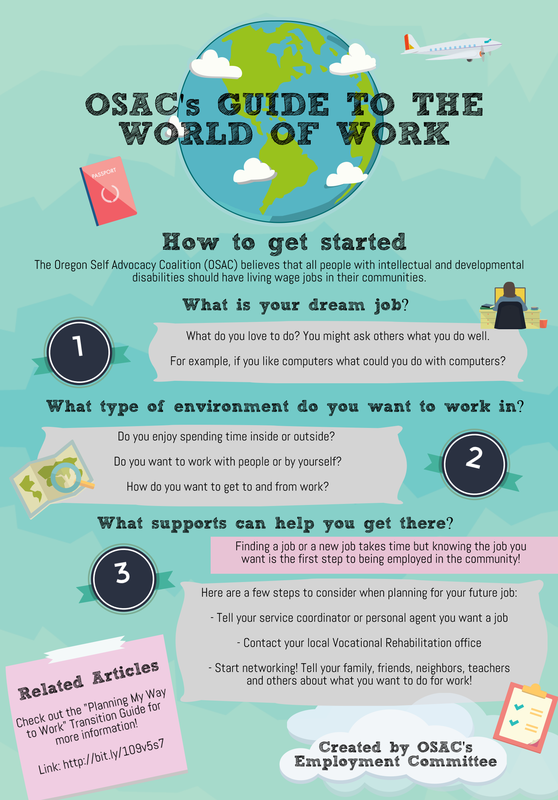 The Oregon Self Advocacy Coalition believes that all people with intellectual and developmental disabilities should have living wage jobs in their communities. Many people with developmental disabilities are told that they are un-employable or that they do not have to work because they get public assistance. Employers share the same public misunderstanding that people with developmental disabilities cannot work. Many people with developmental disabilities are paid less then minimum wage (through 14C). This is discriminatory and keeps people stuck in poverty. Many people with developmental disabilities work in segregated sheltered workshops. We want to be productive members of our communities, have diversity in the job force, decrease stereotypes, and feel like equals. All youth with intellectual and Developmental Disabilities must have a job, internship/training, or post secondary education in place by the time they leave high school. Youth have access to resume training, think college, and job experience. People with disabilities need to be paid a living wage (no more sub minimum wage). Everyone has the right to integrated employment in the community. People who do not want to work in segregated employment settings should get support to find integrated community jobs. All people with I/DD get support to find and keep jobs in the community. Job coaches must have training about how to work respectfully with people with I/DD and to understand their perspectives on employment. The OSAC Employment Group meets by phone on the 2nd Monday of every month from 2pm-3:30pm. If you would like to join this group then email Ryley Newport at ryley.newport@ocdd.org. OSAC's Legislative Committee creates legislative goals for the upcoming sessions.